On November 18, 1915, the Confederate Women’s Home opened in Fayetteville. Mrs. Hunter G. Smith proposed establishment of a home in North Carolina for Confederate widows and daughters some years earlier during the 1908 convention of the North Carolina Division of the United Daughters of the Confederacy (UDC). In 1913, the legislature granted $10,000 for building purposes and $5,000 per year for maintenance. The UDC accepted responsibility for the home’s operation. To live in the home a woman had to be sixty-five or older; a wife, daughter, or widow of a Confederate veteran; and in need. She also had to sign her property and pension over to the state. Originally the home was scheduled to close in 1950, but it twice received ten-year reprieves. By 1981, only seven women lived in the house and it was not practical to keep it open. Today, 65 women are buried in a cemetery on the grounds. Its counterpart institution, the Confederate Soldiers Home, for veterans, operated in Raleigh from 1891 to 1938. On October 22, 1932, painter Elliott Daingerfield died at age 73 in New York and was buried in Cross Creek Cemetery in Fayetteville, where he was raised. Daingerfield left for New York when he turned 21 to apprentice at the National Academy of Design. He joined the Holbein Studios in 1884 where he was influenced the naturalist Barbizon School technique and by artist George Inness. Recuperating from diphtheria in Blowing Rock in 1886, Daingerfield began painting the surrounding mountains, and built three homes, one of which, “Westglow,” today operates as a spa and is open to the public. Daingerfield returned to the northeast and taught composition at the Philadelphia School of Design and the Art Students League in New York City. He received the National Academy of Design Clark Prize for the best figure composition in 1902, and traveled in the southwest under commission by the Santa Fe Railroad Company, painting the Grand Canyon in 1911. His work is noted for capturing the light and mood of various scenes, and is now featured in some of leading museums of the South and the nation, including the N.C. Museum of Art in Raleigh, the High Museum of Art in Atlanta and the Smithsonian American Museum Art in Washington, D.C..
On September 23, 1930, Charles M. Stedman, the last Civil War veteran (Union or Confederate) to serve in the U.S. Congress, died. A native North Carolinian, Stedman was born in Pittsboro in 1841. He graduated from the University of North Carolina in 1861 and enlisted as a private in the 1st North Carolina “Bethel Regiment.” Stedman was promoted to major of the 44th North Carolina Infantry. Afterwards, he returned to Chatham County to teach. While in Chatham County he studied law and was admitted to the bar in 1865. His interest in politics began with the 1880 Democratic Convention. He was elected lieutenant governor in 1884, but failed in his bid for the governor’s office in 1888. Stedman was a University of North Carolina trustee from 1899 to 1915, the president of the North Carolina Bar Association in 1900 and had a second unsuccessful run for governor in 1904. First elected as a Democrat to the United States House of Representatives in 1910 and was reelected nine times, serving until his death in 1930. He was buried in Cross Creek Cemetery in Fayetteville, North Carolina. 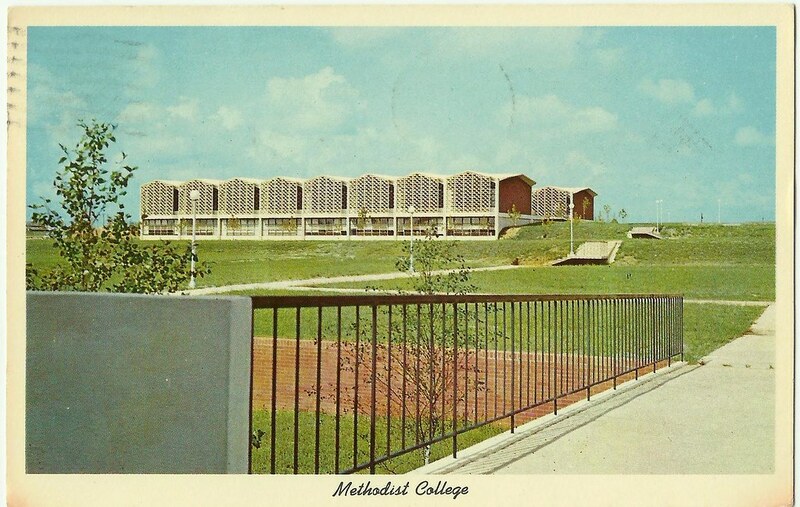 An early postcard of Methodist College. Image from the State Archives. On September 16, 1960, the first class of 88 students was admitted to Methodist College. About five years earlier, citizens of Fayetteville offered the Methodist Church a 600-acre tract and $2 million to establish a school in their town. Fayetteville attorney and future governor Terry Sanford was elected the first chairman of the board of trustees and L. Stacy Weaver was chosen as the first president. When it first opened, the campus included a grouping of contemporary buildings; the architectural plan, created by Stevens and Wilkinson of Atlanta, earned a national citation for creativity and unity of design. The school’s first major expansion came in 1978, when it began offering two-year associate’s degrees in addition to four-year bachelor’s degrees. In 1993, trustees recommended that the college borrow funds to build additional residence halls over the next five years to accommodate 300 new resident students. The trustees further recommended that the college undertake a major capital campaign of at least $10 million for increasing the endowment and constructing a library addition, and two new academic buildings. In 2001, the school had a record enrollment, and inaugurated the first graduate program, which trains physician assistants. In 2006, trustees voted to change the name of the school from Methodist College to Methodist University. U.S. Constitution. Image from the State Archives. On November 21, 1789, the General Assembly, meeting in Fayetteville, ratified the United States Constitution, making North Carolina the twelfth state. The process was not easy, however, considering that in 1788, the General Assembly actually declined to ratify United States Constitution, suggesting many amendments and calling for a Bill of Rights. Knowing that a second convention was to be held, George Washington wrote to the Council of State urging ratification in June 1789. On November 16, 1789, a second convention met to take up the matter again. The Constitution, with the addition of the Bill of Rights, was ratified five days into the convention. North Carolina’s Convention Resolution adopting the Constitution, sent to George Washington by Tobias Lear. Image from the Library of Congress. In 1778, Fayetteville constructed a large brick edifice, called the State House by its builders, to house the General Assembly in the event the town was chosen as the new state capital. However, the Convention of 1788 in Hillsborough chose Raleigh over Fayetteville as the capital. Despite this, the General Assembly did meet in Fayetteville in several times before moving permanently to Raleigh in 1793. The State House where North Carolina became a state remained standing until 1831, when it was destroyed by a fire that devastated much of Fayetteville. Image from the U.S. Navy History and Heritage Command. On August 4, 1857, Secretary of the Navy James Dobbin died. Born in 1814 in Fayetteville, Dobbin entered the University of North Carolina at age 14 and graduated with honors in 1832. He returned to Fayetteville where he studied law, launched his law practice and became active in local politics. Unwittingly nominated for Congress and ultimately elected to the body in 1844, Dobbin refused to run again 1846. He later served in the General Assembly, rising to become the speaker of the House in 1850. 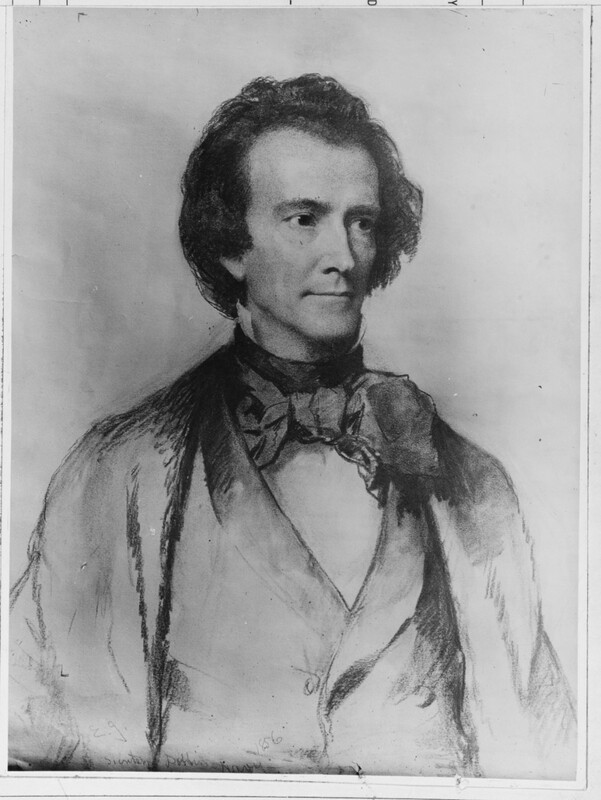 Influential in the nomination and election of Franklin Pierce, Dobbin was awarded with an appointment as the Secretary of the Navy. He worked to reform and expand the Navy, making it a more efficient and effective military branch. As a firm believer in a strong Navy as insurance for peace, Dobbin put 18 ships, including six steam-powered frigates, into service during his tenure. He supported exploratory voyages, including Commodore Matthew Perry’s expedition to Japan, which resulted in an 1854 trade treaty with that country. The four years that Dobbin spent as Secretary of the Navy took a heavy toll on his fragile health. He died just five months after leaving office and is buried in Fayetteville. The USS Dobbin, named in his honor, was damaged at Pearl Harbor during the 1941 attack. Dobbin’s papers are held by the State Archives. An 1825 map of Fayetteville. Image from the Library of Congress. On May 29, 1831, much of Fayetteville burned to the ground. Starting in a kitchen on the northwest corner of Market Square, the fire’s central starting point was part of the reason it caused so much destruction. Though townspeople began trying to extinguish it around it noon, the fire continued to spread rapidly, destroying many of the nearby structures, including the building where the state had ratified the U.S. Constitution. The town’s fire engine was unable to contain the blaze and, indeed, was destroyed itself in the flames. All destroyed, and the streets became a chaotic mess of people trying to save family members and possessions as the fire roared through town. After four hours the inferno was quenched but not before taking more than 600 buildings including hundreds of homes, a school, two hotels, 105 stores, two banks and all but one of the city’s churches. Although many people were injured and almost everyone displaced, no one was killed. Private donations poured into town once news of the disaster spread, with over $100,000 collected and distributed to the people of Fayetteville. Many of today’s older buildings in the city, such as the Market House, are ones built after this spectacular fire. St. Patrick’s Church in an unknown year. Image from Fayetteville State University. On March 17, 1829, Roman Catholic Bishop John England consecrated Saint Patrick Church in Fayetteville. The consecration was the first for a Catholic church in North Carolina. The following week England traveled to Beaufort County, where he dedicated St. John’s in Washington, the first Catholic church built in North Carolina. John England. Image from the National Encyclopedia of American Biography. 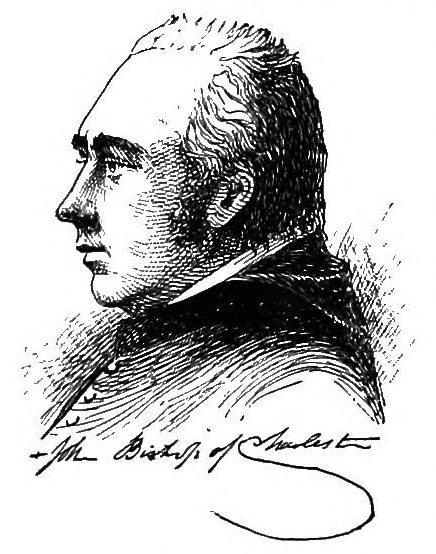 Bishop England directed the Catholic Church in the Carolinas for much of the antebellum period. He arrived from Ireland in 1820 at the age 33 to take charge of the Diocese of Charleston. Owing in no small measure to his energy and steadfastness, the church took hold in North Carolina. On his arrival, small enclaves of Catholics in larger towns met in private homes and church buildings of other faiths and were served on occasion by itinerant priests. Catholic churches were later built in Raleigh, New Bern, Wilmington, Charlotte and Edenton, all before the Civil War. The state remained part of the Diocese of Charleston until 1868 when a new vicariate was created and James Gibbons was installed as the first vicar apostolic. 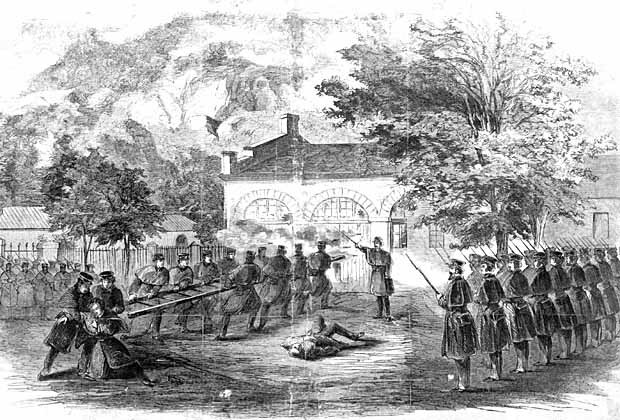 Marines attack the Harpers Ferry arsenal after it was taken by Brown’s forces. On October 17, 1859, Lewis Leary was fatally wounded during John Brown’s raid on the arsenal at Harpers Ferry. Originally from Fayetteville, Leary was a free mulatto who came from a family of saddle-makers. Leary moved to Oberlin, Ohio, in search of economic opportunity and because the town was considered to be among the most racially progressive in America. Once there, he gravitated toward the growing abolitionist movement and joined the Anti-Slavery Society. In 1859, John Brown, a vehement anti-slavery advocate, was looking for men to spark a slave insurrection on the East Coast. Leary joined him enthusiastically. Unfortunately, Brown’s men lacked the resources needed to mobilize local slaves who had not been properly notified of the insurgency. Local militia held off the raiders until Robert E. Lee’s Marines formally intervened. Brown’s men were unable to stockpile the weaponry or to escape. While attempting to flee, Leary was wounded and died several hours later. Though the raid failed, Leary’s death was not in vain. Brown’s raid threatened the South by proving that a slave insurrection was possible, and the seizure was lauded in the North. The episode marked the obvious division between North and South, which would shortly culminate in the Civil War. On April 22, 1861, the U.S. Arsenal at Fayetteville surrendered to a force of state militia troops roughly a month before North Carolina seceded from the Union. At the time of the firing on Fort Sumter 10 days earlier, the Fayetteville Arsenal was guarded by a company of the Second U.S. Artillery. On April 22, the U.S. soldiers were confronted with a large force of nearly 1,000 state militia troops reinforced with artillery. 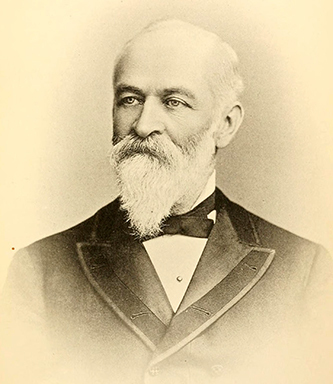 Former Governor Warren Winslow, acting as agent for then Governor John Ellis, negotiated the surrender of the post, which allowed the federal soldiers to leave with their equipment, but forced them to turn over the arsenal’s equipment to the state. By April 27, the Union artillerymen were able to get transportation to Wilmington, and by May 7, the company had arrived at Fort Hamilton in New York City. During the Civil War, the arsenal manufactured small arms for the Confederacy with machinery shipped there shortly after secession from Harpers Ferry, Va. One of the arsenal’s better-known products was the “Fayetteville Rifle,” a copy of the US 1855 rifle. Union Major General William T. Sherman captured the arsenal in March 1865, and had the installation destroyed.